ABU DHABI, UAE, July 20, 2016 /PRNewswire - MySolutionInfo/ -- Masdar Institute of Science and Technology, a research-driven, graduate-level university, focused on advanced energy and sustainable technologies based in Abu Dhabi, has moved up to the 14th spot overall in the 2016 US News and World Report Best Arab Region Universities Rankings, up from the 23rd position last year. The institution has also edged up to fifth spot in the 'Energy' field, eighth in Chemistry, and ninth in Engineering, while being ranked tenth in both 'Environmental Science' and 'Materials Science.' 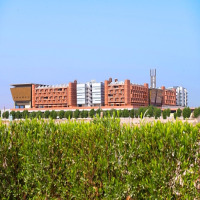 In the 'Academic Reputation' category, Masdar Institute is ranked eighth in the region by the US News and World Report. Dr. Behjat Al Yousuf, Interim Provost, Masdar Institute, said: "Masdar Institute's ranking by the 2016 US News and World Report Best Arab Region Universities Rankings strongly indicates that we are committed to advancing UAE and Abu Dhabi's intellectual capital through advanced research and development. We will continue with our efforts to create high-value human and intellectual capital in advanced energy and sustainability fields, while helping to place the UAE at the forefront of research and innovation that address the needs of Abu Dhabi and the globe." Inclusion in the US News and World Report's reputation surveys requires a university to have approximately 400 papers or more published in the five-year period from 2009 through 2013, as measured by Scopus, the largest abstract and citation database of peer-reviewed literature including scientific journals, books and conference proceedings. As of January 2016, Masdar Institute had already published over 1,000 articles in peer-reviewed journals, and more than 600 conference papers. The Best Arab Region Universities rankings are based on data and research metrics provided by Scopus, which is part of the Elsevier Research Intelligence portfolio. The overall rankings also draw on ratings of schools (universities) by academics and employers in the region who were surveyed by Ipsos, a global market research company based in Paris. The second edition of the overall rankings covers 124 universities spread across 18 countries, up from 91 universities in 16 countries included in the inaugural rankings last year. The academic institutions are ranked based on their academic research performance and, for the first time this year, on their reputations. Since the start of classes in 2009, Masdar Institute has steadily increased its intellectual property in clean energy, advanced materials, and water and environmental engineering. It currently has 10 registered US patents, over 70 pending patent applications, and over 120 invention disclosures from faculty and students, firmly establishing its place as a leader in intellectual capital development in the UAE. Masdar Institute has also secured over US$72 million (around AED264 million) in industry and government sponsored research contracts with more than 50 organizations (50% in the UAE), with a strong pipeline of new agreements planned for 2016. The Masdar Institute of Science and Technology (Masdar Institute) was established by the government of Abu Dhabi as a not-for-profit, private graduate university to develop indigenous RandD capacity in Abu Dhabi addressing issues of importance to the region. In collaboration with the Massachusetts Institute of Technology (MIT), Masdar Institute has developed an academic and research platform that articulates its mission and vision according to critical energy and sustainability challenges. Serving as a key pillar of innovation and human capital, Masdar Institute remains fundamental to Masdars core objectives of developing Abu Dhabis knowledge economy and finding solutions to humanitys toughest challenges such as climate change.